By now everyone must have heard about Google Wave, the communication and collaboration platform announced at Google I/O. Google just announced that they are ramping up towards 20,000 developers on the current sandbox and will extend to 100,000 users by end of September. This will give many more people to opportunity to experiment with Wave. One of the key features of Wave is its extensibility. For example, you can create robots, which can participate in waves just like humans do (that is once they are invited in). As I hinted last time, I intended to build a "make the Sun lawyers happy" robot, which would replace any mention of "Java" with the preferred version of "Java(TM)-based technology". Alas, I was not able to get it working in time for JavaOne. So I took advantage of the Tokyo Wave Hackathon organized by the Tokyo Google Technology User group to receive some debugging aid and get my robot working. Writing robots is relatively simple thanks to the Wave Robot API, which was just open sourced. App Engine (for Java) works with servlets, so it's natural that the API provides a servlet base class, AbstractRobotServlet. Your own servlet inherits from this base class and gains access to methods that check for different event types and read or modify the wave's blips. Of course, the App Engine servlet as access to all the other App Engine API's, such as persistence through JPA or JDO. A robot cannot simply call Wave or read a wave. It has to be explicitly invited by a user first. The robot name is currently derived from the App Engine name, meaning your servlet at xyz.appspot.com will be known to the wave sandbox as xyz@appspot.com. Once invited into a wave conversation, the robot reacts to events issued by wave, such as the addition of a new participant or the submission of a new blip. Each robot exposes a capabilities.xml file, which describes the events that the robot would like to listen to. The method responds to two types of events: WAVELET_SELF_ADDED and BLIP_SUBMITTED. We did not actually subscribe to the former, but it arrives by default whenever the robot is added to a wave. In response, the robot appends a new blip and populates the blip text with a simple greeting. The "meat" of the robot is in the remainder of the method, which loops over each submitted blip. If the blip is not submitted by this robot (trying to stay out of infinite loops), it replaces occurrences of words based on a dictionary. I hacked this together really quickly, so the algorithm replaces only the first occurrence of each word, so don't repeat yourself too much. I guess should have written a test first. A couple of items to note: the BLIP_SUBMITTED event appears to be triggered when a new blip is submitted or when an existing one is edited. Unfortunately the JavaDoc for the event constants is still empty, so it's better to run a quick check to make sure your robot gets the events you were expecting. Also, my robot does not work on the Wave title. I would have to subscribe to WAVELET_TITLE_CHANGED to catch this event. The rest of the robot is standard servlet fare. You need a web.xml file, which maps relative URL's to servlets. The robot servlet has to live under the relative path /_wave/robot/jsonrpc. The name of the robot as a wave participant is derived from your App Engine application name, meaning a robot at xyz.appspot.com will be known to the wave sandbox as xyz@appspot.com. Somehow, it became a quick fashion to name all robots ending in a ""y", giving it a cute-y name like "spelly" or "groupy". Following this rule I should have named mine "replacey", but I felt it sounds too dorky. This robot is very simple, but it still took me some time to get it working. In the end it turned out I had some nasty version mismatches between the Wave Robot SDK, the App Engine run-time and the Eclipse plug-in. When your robot does not seem to receive the desired event or does not respond at all, things can be pretty frustrating. Once you have a basic robot working, debug and test cycles are relatively swift thanks to the easy deployment of App Engine applications. So I'd always recommend to start with a "Hello World" robot and go from there. The bottom of the Wave Robot Api Overview has some useful troubleshooting tips. If your robot is not well, it's best is to check out the App Engine application logs, which are available from the App Engine console. For example, my logs alerted me to missing object ID's on my JDO classes. To make our robot a bit more useful (and interesting), I decided to give it a dictionary data store, meaning you can define your own terms and chose their replacements. 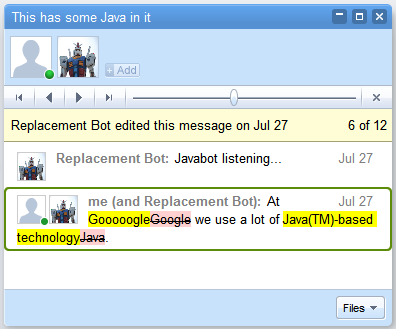 Replacing Java with Java(TM) will be just one of many useful replacements. For example, you could replace the phrase "Moron!" with "Thank you very much for your suggestion. I will be sure to bring up your feedback at our next internal meeting." This way you get all the satisfaction without losing political capital. App Engine for Java supports JPA and JDO for persistence. Having successfully escaped from both throughout my career, I decided to see what it would take to get JDO-based persistence working for someone who has no clue. The good news is that this part was pretty pain free. The App Engine Eclipse plug-in deploys the right jar files (assuming you have matching versions of the plug-in and SDK) and sets up a jdoconfig.xml file for you. PMF is a singleton PersistenceManagerFactory . The rest of the code is pretty self-explanatory: it inserts one entry into the map for each row in the data store. deleteDict iterates over all entries matching the key and deletes them one by one. In order to enable management of the persistent dictionary, I made the robot understand and respond to a simple set of commands, #help, #replace, #showdict. If a blip starts with such a command, the robot responds with a child blip by calling createChild on the blip. I had some struggles getting the output formatted in any reasonable way. The docs state that some HTML is allowed, but did not indulge us in which tags are part of that elite club. I got tired of trying pretty quickly, so the output looks pretty raw. What really tripped me up was that TextView.append does simply nothing if the string contains a "greater than" sign. You'll have to use > instead, so it does not think you are trying to do some invalid HTML. It would have been nice to mention that in the docs. Ironically, the supplied JavaDoc for appendMarkup makes a similar mistake by also forgetting to escape special characters, causing the generated JavaDoc HTML page to interpret the tags instead of displaying them as text. When I was trying to figure out why my test is now appended to the TextView, I figured I'd simply check out the source code, but most of the methods of the robot API simply translate the Java call into an instance of Operation, which is then serialized and returned to the Wave server. This means looking at the robot API source does not really help you answer detailed questions like these. Because you can invite more than one robot into a wave, you can inadvertently end up building a new version of Robot Wars. For example, one robot could reply to another one's changes and vice versa. The current solution is to give robots limited quota, so infinite loops will ultimaltely run out of steam. Now that everything is working, you can put the icing on the cake and give our robot a profile servlet. This servlet equips the robot with a proper name and an avatar by overriding the respective methods of the ProfileServlet base class. Map this servlet to /_wave/robot/profile in web.xml and you are good to go. I chose a picture I took of the live size Gundam, which is currently on display in Odaiba, Tokyo. Robots don't get much cooler than that.